Sin makes it to the Top 5 Finals of the Vancouver Nightlife Awards! SIN CITY HAS MADE IT TO THE TOP 5 FINALIST ROUND IN THE 2013 VANCOUVER NIGHTLIFE AWARDS! Thank you to EVERYONE who has voted thus far – Sin City made it into the top 5 in every category in which it was nominated! BUT THE VOTING ISN’T OVER … if you’ve already voted, no need to do anything, but if you HAVEN’T voted yet, we need your vote! And if you DID vote, but for someone else who didn’t make it to the top 5, you have until the end of the month to head over to the voting site and change up your vote! 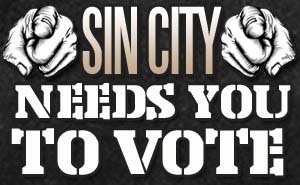 SIN CITY NEEDS YOUR VOTE! If you’ve ever called Sin City home or want to help the alternative scene represent in the 2013 Vancouver Nightlife Awards, we need YOU to vote! EVERY vote counts and it only takes a moment to cast your ballot! This is your chance to take a moment and give back for all the hard work that goes into each and every event. Top 5 Voting ends May 31st so get those votes in ASAP! Note : you don’t need to register an account or anything – when prompted to do so, you can just sign in with your Facebook account. Even if you don’t live in Vancouver, if you support non-top 40 event nightlife, please take a moment and vote for Sin City and help add some colour to the otherwise ultra vanilla mix at the Awards!